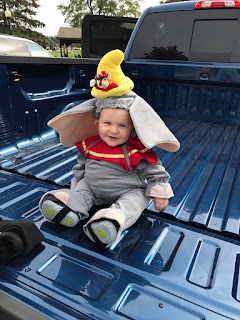 You need a truck to haul elephants...Here is my great grandson Max in his Dumbo suit. This is one happy child. Most all the time. 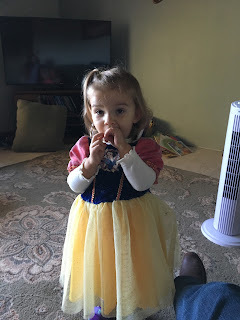 Layla my great granddaughter, in her Snow White outfit. Sorry this picture is so dark. Here's Layla In another costume going to a party. 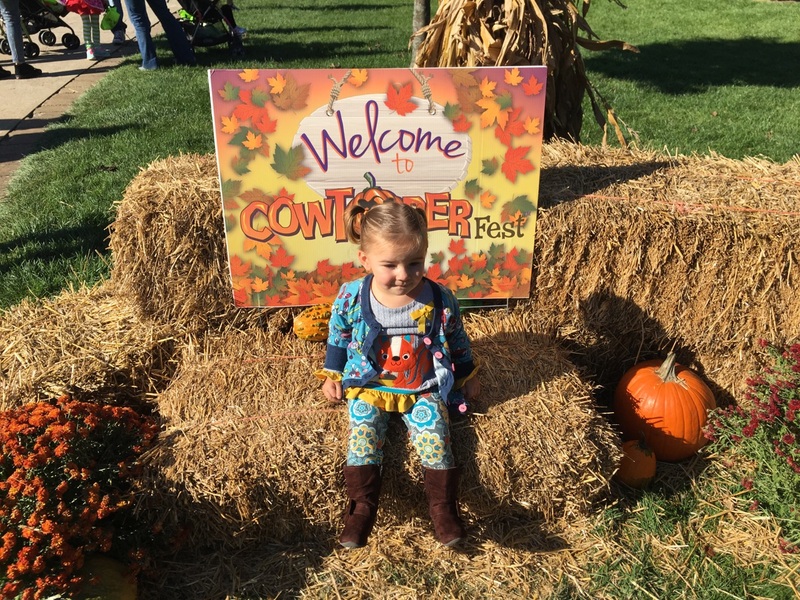 Here's Layla at the Cowtober fest. 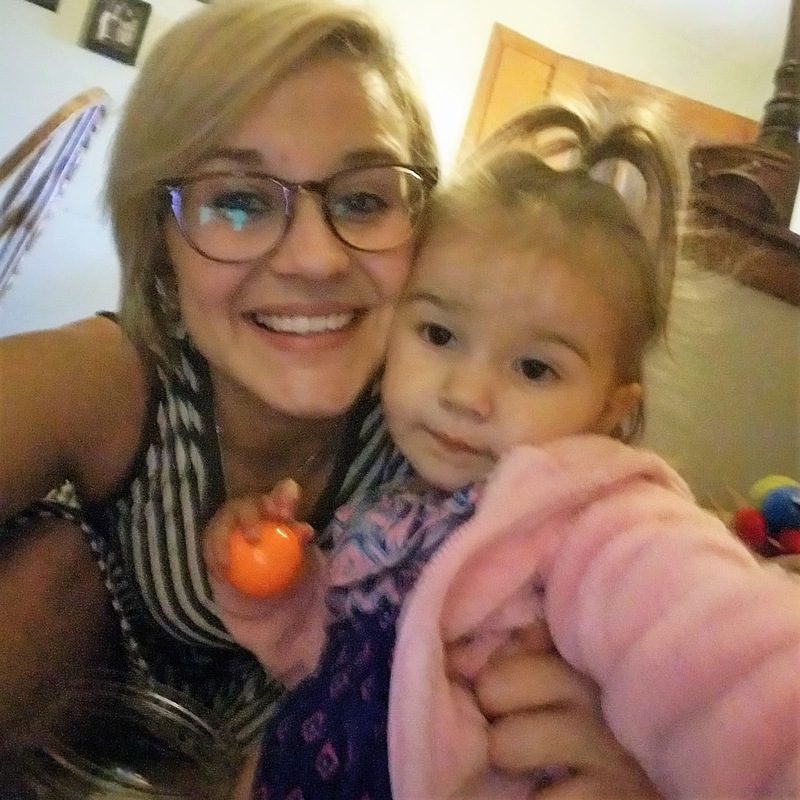 Layla and her beautiful mother Emily. This girl is the best mommy. 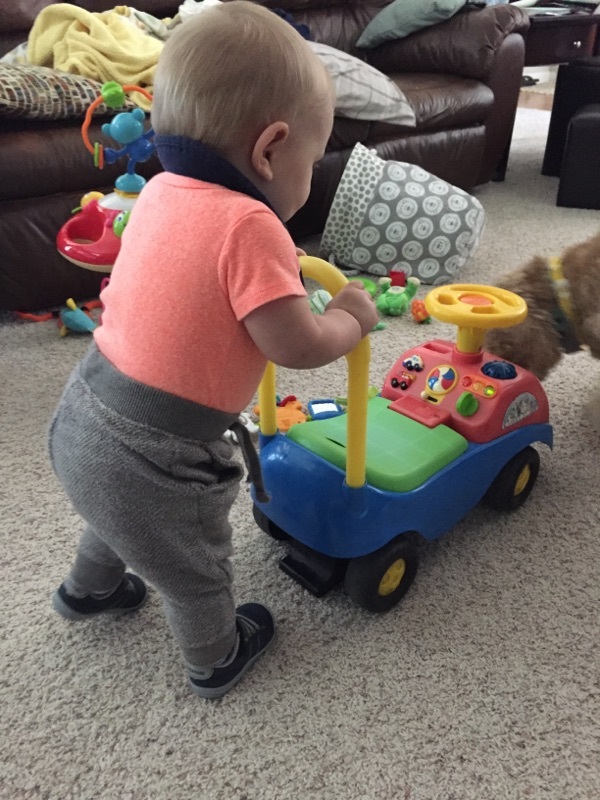 Another shot of Max...he's trying to walk. He pulls himself up with this car and walks behind it . So funny. My granddaughter Emma holding her nephew Max. I think Emma is a wonderful aunty to Layla and Max. The little ones light up when they see her. I love that. I am sending a thank you to Nana Diana....look just like you said Diana,...I loaded my pictures from my phone. I had my computer in the wrong setting. LOL. As Homer Simpson would say; DOH . Saturday I was going to have lunch with my daughter Angie. When I got to her house I was surprised to find Karen and Savannah were there and going to lunch with us. It was lunch at the D.Q. Nothing fancy just fun. After lunch we went to a new little shop in town. This shop is actually very near Angie's house. A small place, that sells purses, clothing and jewelry. There were a few signs. Savannah chose this hat that says love on it. Her mother , Karen, bought her some leggings and a tunic top also. Here's some of the bracelets. More jewelry, wallets and hats. This shop is almost painted in too dark a color...or they need more lighting. Two young ladies were running it, one the owner. Very sweet and helpful. The shop is called Soul Sisters. I like that name very much. That's how I feel about many of my blog family, that we are soul sisters. So we met up with Ted's other brother Mic. We decided to eat at the Southfork Bar/Grill again. I want you to see the boat flip over for a porch at the back door. This is the mural along the side entrance. Ted ordered mushroom and cheese smothered chicken with waffle fries. Mic had the roast beef sandwich with French fries. I had a club sandwich with chips. I had to show this sweet old Nova that was parked at the side. I saw it the last time we ate there. So the owner must lived in town or close by. This is the dining room at the nursing home. Lunch was finished and cleaned up when I took this shot. Sorry it's too dark. This is one of the pretty courtyards. The grounds are always cared for and clean. We had good news with Cliff. He has had some away trips to his church and home. He is getting some movement of his right side. It's a long process. But I felt so much better seeing this. Linda, his wife , says he is getting good PT and speech therapy also. He did not seem as sad this visit . We are so thankful. Thanks to all of you who may have had good thoughts or prayers for Cliff. You are so appreciated. 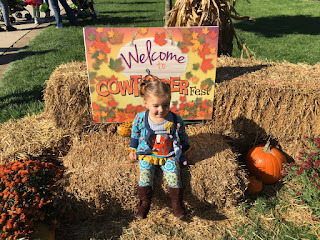 These are photos I took last year of a pumpkin patch in a town east of here. I did get to go by there again this year, but forgot my camera. 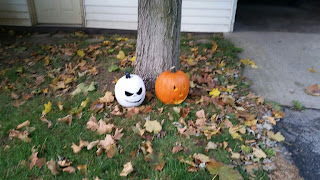 Yes, the man that lives at this place was growing those pumpkins again. Just as big as this . He has to use a block and tackle to lift them onto a trailer. Some autumn color in this yard. One of my favorite trees in town. So many colors on it at once. One of the shops in town selling mums and pumpkins . You all know that seconds seem to really count, when the skies are changing at sunrise. It was so pretty with the tall pines of the neighbors down the road. The little woods in back is losing it's colors quickly. This bright orange tree stands out. Sun is up now and coming thru the trees. I really like the long shadows of mornings and evenings. More leaves have fallen here. When the sun is full over the morning horizon it reflects off the neighbor's windows , a half mile away. It's so bright it seems like flood lights. Back inside, I took a couple shots of the mantle. I decided to turn the books old page edges facing ,rather than cover the books. 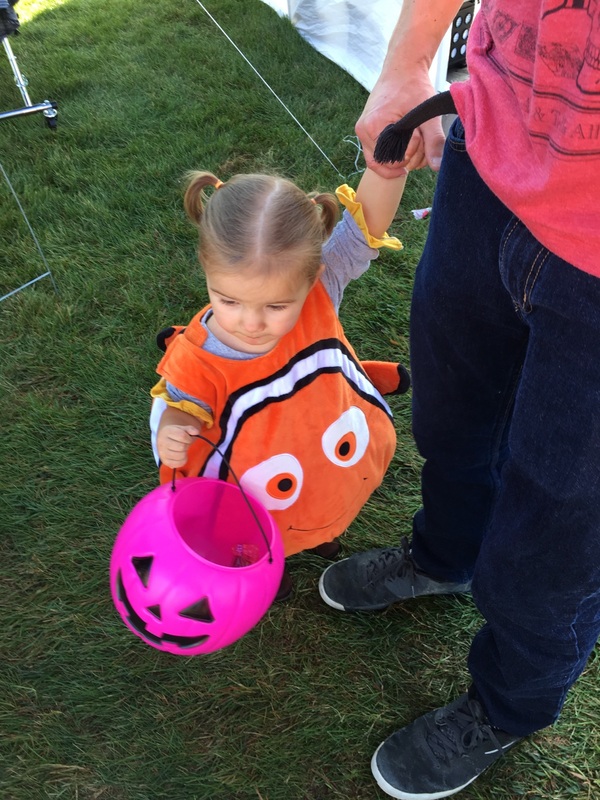 This is the picture of my great granddaughter's head as she looked out a window....since it's such a cute little punkin head it fits right in with fall décor. I changed up the table decorations. Almost too dark to get a good picture. :):) I will take from and add to this for Thanksgiving . We did not get frost last night....hooray. It was a cold morning for Ted to go golfing . He golfs in Kokomo and it was 36 degrees there this morning. Brrr. I have a dental appointment and you all know how much I am looking forward to that...NOT. It's constant follow ups on the same teeth and the sensitivity. I do use the special toothpaste for that. Yesterday's sunset. It was a windy but gorgeous day , Sunday. The entire weekend was nice. Chilly mornings and pretty days with sunshine. Evening shadows on the shop. I always love to see these. Shadows of my garden decorations on the building's wall. I hope this ornament never falls apart, because I have loved from day one. Here's some dragonfly garden picks' shadows. This is by the pond, along side the shop. This is one of our tulip poplar trees. We have two and the neighbor has one also. Plus a catalpa, sycamore, maples, birch,flowering redbud, and crabapple. Then there's the pines with their cones and needles. There's leaves in every little spot out here. This mum looks good now, but with frost being forecasted this week....well who knows if I'll even cover them. I would like to have some hang on till after this month , so I will probably cover the containers. Ted and I took 3 big bags of things to goodwill , on one of our outings this weekend. That was good to rid ourselves of some excess. We went to tractor supply and bought a tub of mouse poison for the shop, lean-to , and shed. Since we have no cats around here...we have mice in those areas. I tried to borrow Emma's cat Izzy. LOL. She was not about to loan that cat. Emma was happy with a caramel sundae. Layla is kissing on a dolly we gave her. It was part of Emma's old bath toys. I found a bag of them that she had played with thru the years . Layla starts feeding herself some ice cream. She really liked it, even though she had to people watch the whole time. It was fun to watch her . I love that we had a small town lunch with our girls. It seemed sad to come home without our Emma....the time went too fast. We did not do any crafts, or really visit much. 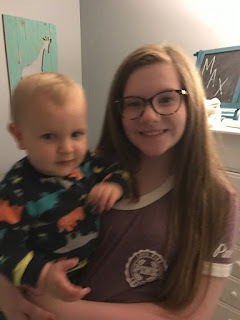 She was tired from being up late the night before (fall break) and playing with her phone...I never let her stay on it in the evenings while here. She charges it up for the next day though. LOL. The leaves are falling fast with the rain we have had. Frost was predicted for last night. I did not try to cover much. It even looked cold when the sun was going down, Friday evening. It's 40 degrees this Saturday morning, as I write this at 8:00. I do not see any frost on things. The sun is rising and it looks like a red sky to begin our day. The white wave petunias are still hanging on here. This geranium looks so bright and fresh, here in October. My little porch mum has bloomed out and looks sweet. I have been gathering pinecones, that the winds have blown from the trees. I like using things from our yard in decorating, when I can. Look what a pretty ending to the day...this is from Saturday. It's been a slow start to our week here. Ted is having the truck winterized, changing the oil, rotating tires, and topping of fluids. Then it'll be a trip to goodwill later. Taking in more bags of clothes and shoes. I had a sick spell and went thru many tests, the past month.....so my sorting and tossing stopped for awhile. Now I can get back to it.